WASHINGTON, DC — Since the President’s nomination of Debo Adegbile to head the Civil Rights Division of the U.S. Department of Justice, some media outlets have zealously revisited the case of celebrated political prisoner and radio journalist, Mumia Abu-Jamal. Specifically, controversy has arisen over Abegbile because his name appears in post-sentencing legal briefs that successfully challenged the constitutionality of Abu-Jamal’s death sentence. After more than 28 years on death row and having survived two execution dates, Abu-Jamal was transferred in 2011 to general population at the State Correctional Institution, Mahanoy, in Frackville, Pennsylvania, where he is now serving a life sentence. Supporters of Abu-Jamal’s will launch a new chapter in their efforts to free Abu-Jamal coinciding with his 60th birthday this spring called The Campaign to Bring Mumia Home. The campaign is compelling Eric Holder and the Justice Department to intercede for Abu-Jamal and has already launched an online petition and crowd-funding campaign to support advertorial content advancing the group’s efforts. “In the context of the recent celebrations of Nelson Mandela’s life and legacy in the U.S., the example of political imprisonment represented in the case of Mumia Abu-Jamal is notable for its absence in public discussion,” said Dr. Johanna Fernandez, co-coordinator of The Campaign to Bring Mumia Home. “Due to Abu-Jamal’s affiliations with the Black Panther Party and because the crime for which he was charged involved the killing of a white police officer, Daniel Faulkner, by a black man, Abu-Jamal’s trial was politically charged and rife with prosecutorial misconduct.” Abu-Jamal’s investigative journalism covering police brutality and corruption in City Hall, compounded by his favorable reporting on Philadelphia’s radical MOVE organization, made him a target of state and municipal law enforcement. Declassified memos illustrate that the Philadelphia Police Department (PPD) in consultation with J. Edgar Hoover’s “Counterintelligence Program” (COINTELPRO), had for several years tried to implicate Abu-Jamal in criminal conduct. Although the crime was a violation of state law, the investigation of the 1981 fatal shooting of Officer Daniel Faulkner was not conducted by the PPD’s homicide unit, but instead by a controversial unit of the Philadelphia office of the FBI. Formerly named the Civil Disobedience Unit (CDU), the unit remained an artifact from Hoover’s COINTELPRO that was vastly expanded in 1967, and maintained functionality for over a decade after the April, 1971 conclusion of the centralized COINTELPRO. The program’s centralized closure came one month after the March 8, 1971 burglary of a two-man FBI field office in Media, PA, wherein over 1,000 classified documents were stolen, duplicated, and circulated to dozens of activists and journalists in the region. Mumia Abu-Jamal, 19-years old at the time, was one of the recipients of these documents. 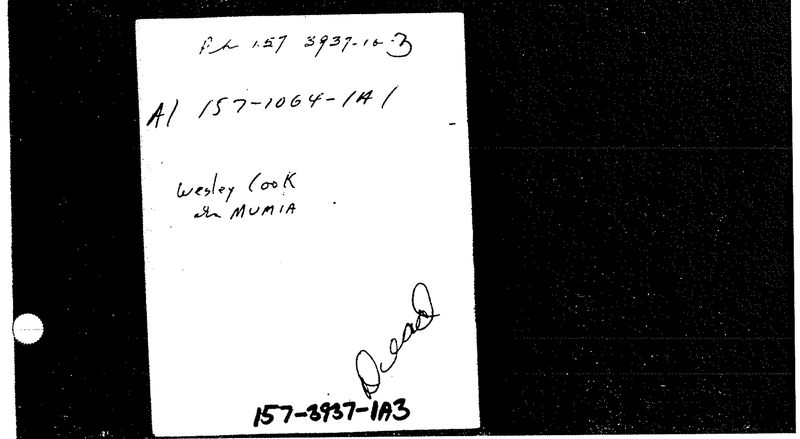 Mumia’s name appeared several times in the files. The dossiers exfiltrated during the March 8, 1971 break in at Media, PA, are once again making headlines, as the surviving members of the group responsible for the burglary have come forward to tell their story. The burglars believe their 1971 heist provides an important context for our nation’s current debates over national security in the wake of Edward Snowden’s whistle-blowing. Freedom of Information Act (FOIA) requests have complemented the revelations made by the Media PA documents, including several responsive requests filed by Abu-Jamal himself [pgs 1-408 HERE, 409-814 HERE]. 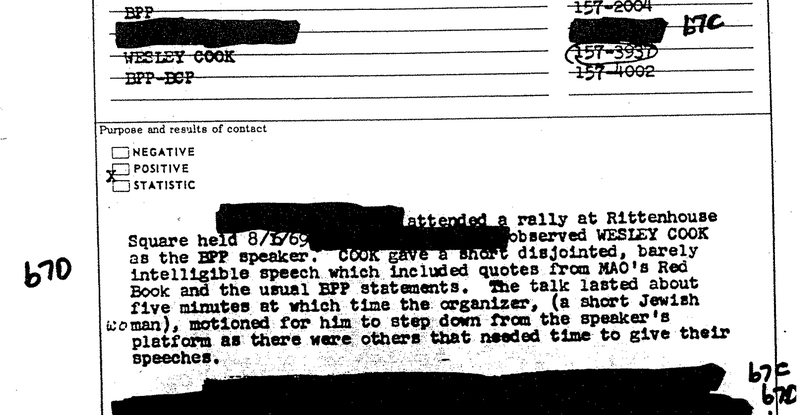 These documents, loaded on the front end (during Hoover’s tenure), detail an obsession with a young Abu-Jamal, beginning in 1969, when a 15-year-old activist, then known by his peers as Wesley “West” Cook, starts attending anti-war demonstrations in Philadelphia and “Liberation Schools” programs organized by the Black Panther Party, and end, tragically, 12 years later, with incongruent accounts surrounding the shooting death of Officer Faulkner. What is most apparent within the mosaic created between Abu-Jamal’s FOIA requests and the COINTELPRO documents seized in the 1971 Media, PA break-in, is that despite the program’s “official closure” in 1971, the resources and decentralized elements of the program remained intact for several years thereafter. This assertion is compounded by the 1978 testimony of then Acting FBI director, William Webster, when he indicated that the majority of COINTELPRO resources had been rerouted by 1976 with only a handful of operations remaining. The unique interests of the Philadelphia FBI office was one such example of COINTELPRO resources that lived past their expiration date as they discontinued CDU operations in name alone, while advancing the same investigations that began under the direction of Hoover’s earlier, centralized efforts. For Mumia, the only thing that changed were the actors outside Philadelphia directing these investigations, specifically in his case it was the interim director of the FBI and Special Agent in Charge (SAC) of the FBI’s Albany, NY office. In 1973 the Albany office entered a curious conversation with the Philadelphia office surrounding the possibility of implicating Abu-Jamal in the assassination of Bermuda Governor, Richard Sharpels and his aide, Hugh Sayers. Upon visits to Mumia’s mother, as well as his place of employment, The Bell Telephone company, the Philadelphia PD made a recommendation not to advance the investigation. Interviews with Abu-Jamal’s coworkers established his presence at work the time of the assassination and the FBI ended pursuing Abu-Jamal for the Bermuda shooting shortly thereafter. Abu-Jamal, who had left the scattered affinities of the Black Panther Party by 1971, remained a person of interest to the FBI, and for nearly 12 years the agency continued in its attempts to implicate him in criminal conduct. While attending Goddard College in Vermont, the FBI utilized fellow students as informants to observe Abu-Jamal. In early 1973 Abu-Jamal returned to Philadelphia where he expanded his interests in radio journalism and subsequently gained a sizeable base of devout listeners. 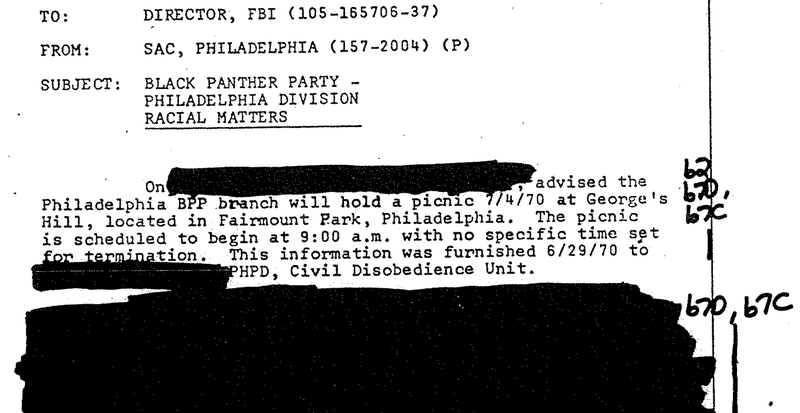 Between 1973 and 1981 the Philadelphia FBI office maintained an unflinching campaign of surveillance and repression against Abu-Jamal, sending informants to picnics he attended in Fairmount Park, and stood behind him taking notes while he attended jazz concerts in Rittenhouse Square. Time and time again the documents show that despite the FBI’s tireless attempts to implicate Mumia in wrongdoing they return to report Abu-Jamal as only engaging in constitutionally protected acts of speech and association. These patterns of repression illustrated in the documents cast doubt on the assertion that Abu-Jamal was capable of, let alone responsible for Officer Faulker’s murder in 1981. Abu-Jamal’s supporters uphold his innocence. According to Professor Johanna Fernandez of The Campaign to Bring Mumia Home, “the most important and least known fact in the case is that a fourth person was present at the crime scene and his presence was repressed at trial by the prosecutor and the presiding judge. The Campaign to Bring Mumia Home has launched a petition to the Department of Justice calling for Eric Holder to support the release of Mumia Abu-Jamal. The Campaign is determined to take advantage of the brief political window before the end of the Obama administration, to win Abu-Jamal’s freedom. It is bringing together a new generation of young activists alongside the various currents within the 32-year old movement to Free Mumia. It has launched a parallel crowd-funding campaign called “60,” in honor of Mumia’s 60th Birthday, to fund a series of ads in Philadelphia highlighting the petition, Mumia’s innocence and mobilize the police corruption and prosecutorial misconduct in the case. Tagged COINTELPRO, daniel faulkner, Debo Adegbile, J. Edgar Hoover, Johanna Fernandez, Mumia Abu-Jamal.